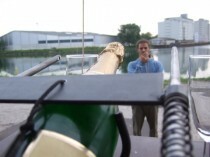 masssabrage is a machine that transfers the idea of opening a bottle of champagne with a saber from the age of Napoleon to the age of technology and mass production. The technique is called sabrage. The saber is slid along the body of the bottle toward the neck. The force of the blade hitting the lip separates the collar from the neck of the bottle. The cork and collar fly with up to 200 km/h for up to 17,64 meters.